Two readable government reports have been published, one from the US, the other from the UK. 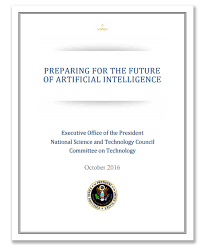 In one of Obama’s last acts in October, the Whitehouse published an excellent overview of AI 'Preparting for the Future of Artificial Intelligence', pointing to the many ways AI can, will and should benefit the US economy. What really caught my eye was the case study and two recommendations around learning. The US Navy used an AI tutoring system to capture ‘expertise’ that traditionally took 7-10 years to complete, then trained AI software to be an intelligent tutor in a 16 week intensive course, as a one-to-one expert. The results were impressive as the AI-tutored students “frequently outperform Navy experts with 7-10 years of experience in both written tests of knowledge and real-world problem solving…. by a wide margin”. This, and other findings led the report to make two recommendations around the use of AI in learning. “The Federal Government should explore ways to improve the capacity of key agencies to apply AI to their missions… to support R&D to determine whether AI and other technologies could significantly improve student learning outcomes." " …develop a community of practice for AI practitioners across government. Agencies should work together to develop and share standards and best practices around the use of AI in government operations. Agencies should ensure that Federal employee training programs include relevant AI opportunities." In November, the UK Government published another excellent and readable report, with the title ‘Artificial intelligence: opportunities and implications for the future of decision making’. It is as good an introduction to the main concepts of machine learning (supervised and unsupervised) and deep learning, as I’ve read. Although it falls short on the concrete recommendations I found in the US report. It’s good to see Governments wake up to what is actually happening in AI. This is not a future tense issue, it is past tense. AI is here in Google, social media, Netflix, online dating, finance, fraud detection, spam detection, sports, healthcare and now education. It is easily the most important new trend in IT as every major tech company in the world is investing in AI and making acquisitions. My own view is that it will also disrupt education and training with products such as WildFire that produces online learning on one click of a button, and CogBooks with its adaptive learning platform. Let's not be left behind, as we so often are when it comes to the use of smart technology to do smart things.